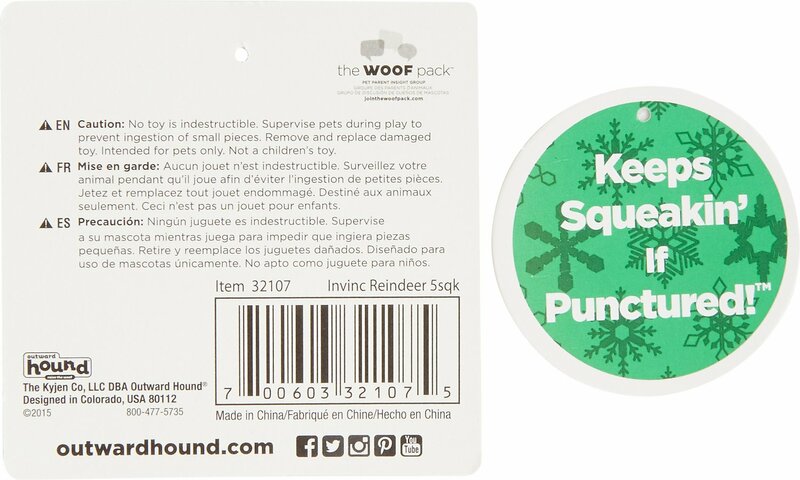 The holiday fun might just last all year when you stuff your precious pup’s stocking with the Outward Hound Holiday Invincibles Reindeer Dog Toy. Made with innovative squeakers that keep on squeaking even after they’ve been punctured, this woodland critter is made to stand up to even the toughest chewer. This cute, cuddly animal also feature two layers of super-tough fabric for even more long-lasting durability and thrashing fun to keep your confined canine from getting cabin fever when it’s too cold to play outside. High-quality toy is engineered for extra durability that stands up to the toughest chewers. Innovative squeakers are designed to keep on working even if they’re punctured. Dual layers of extra-tough fabric provide added protection and strength for long-lasting play. 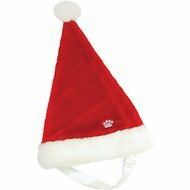 Contains no stuffing, so there’s no mess to clean up even if your pooch does manage to make a hole. Two sizes available to accommodate extra-small to small and small to medium breed dogs. Is your sweet-natured pooch secretly known as the mighty stuffed toy slayer? Pet parents that have tried all kinds of chew toys can rely on Outward Hound for durable playtime fun that outlasts their pet's powers of destruction. To begin with, there's no stuffing for your chewing mastermind to pull out, and every toy is loaded with squeakers to drive her wild. They've even got puzzle toys for doggie prodigies to show off their smarts. Just like their name says, Invincibles can take pretty much anything and still keep squeaking. Designed for rough play, these cuddly plush toys have special Dura-Tuff lining and double-layered seams so they can survive any chewing frenzy without ripping. They're stuffing-free with puncture-proof squeakers that can never be silenced, even when bitten. If you've got a small biter, try an Invincibles Minis pig, duck, dog or hedgehog. Sound the alarm—these Fire Biterz are the latest and greatest squeak toys to stand up to mighty mouths. Made from super-tough firehose material, these red and green lizards come with two or three squeakers that still make noise, even when they're punctured. And better yet, there's no stuffing that can be pulled out by overzealous chewers and dragged around the house. What if your dog's pretty clever and needs a different kind of challenge? Outward Hound's Hide a Bird, Hide a Squirrel and Hide a Bee puzzle toys appeal to your pup's instincts as she sniffs out the animals hidden in nests, trees or hives in an exciting game of hide and squeak. Squeakin' Animals birds, squirrels and bees are stuffed inside the hideaway puzzle toys for your dog to discover, and these mini squeak toys are also fun to play with on their own. Pups that always have to have the last squeak can satisfy their urge with Squeaker Matz. They've got rows and rows of squeakers, and dogs love shaking these flappy toys back and forth to satisfy their hunting instinct. Squeaker Matz Minis are the perfect fit for tiny jaws, and the Long Body size can spark an impromptu game of tug-of-war with you or a pack buddy. The Ginormous Gator has 32 squeakers for squeaker-happy pups that can't get enough. Designed for dog lovers, by dog lovers, Outward Hound is made to keep up with your active lifestyle and withstand your pet's test of durability. By developing products that encourage fun bonding experiences between pets and their parents, Outward Hound nurtures our relationships and improves the lives we share with our dogs. Their unique lines of performance gear and heavy-duty toys create engaging and interactive experiences with products that push the boundaries of playtime and Raise The Woof. Bought this for my one dog whose sole mission in life is to destroy every squeaker toy in the universe - she met her match with this little guy. Actually bought the Gingerbread Man as well and both toys have not only kept on squeaking, she hasn't managed to rip them to shreds yet either. These have held up much better than toys purchased for more money. Would recommend this to anyone with a relentless chewer. I think this is his longest standing toy! It has not been ripped to shreds in the first few minutes of getting it. I will be ordering more of these! Bought the cute reindeer toy as a back up. I have one from years ago. Our new foster dog is obsessed with toys and is tough on them. The outward hound invincibles are holding up as all the tugging chewing and squeaking doesn’t phase them. This little toy will be around for the next wild crazy foster puppy. Cute, but not so "Invincible"
My dog ripped this toy open on the first day. This toy would probably hold up much better if you have a dog that doesn’t intentionally rip things up. My dog loves this toy !!! My dog gets so excited when we get the Chewy order....she saw this toy in the box and grabbed it before I could even get the box all the way open....she loves her reindeer toy so much..she brings it to bed with her !!!! I cut off the fuzzy hair between his antlers. My ch-weinny loved Rudy at first. He seems to not like the flexible 'tube' inside of the toy. He was excited about the toy at first but now it lays around unused. Fun toy! Ziggy loves it! Very fun! I bought this for my rescue Pug for his 5th birthday. Every part of it squeaks. He loves it!!! My dogs really enjoy playing with this toy. It is very durable and they play with it quite a bit.